Motoplat stators as they age become weak. The symptoms include hard starting and fouled plugs. We have started repairing stators for Vintage enthusiasts that have few or no options for replacement. We offer an alternative to high priced replacements and are repairing 3, 4 ,and 6 pole stators on a regular basis. A new spark plug cap, wire replacement, and cleaning can sometimes solve the problem but eventually the wire degrades and a rewind is necessary. We are continually testing durability on our own engines.The warranty period is now 3 years. I am confident it will be increased to 5 years soon. I believe with the new high tech wire we use and flexible epoxy coating the rewound stators will last longer than the original. 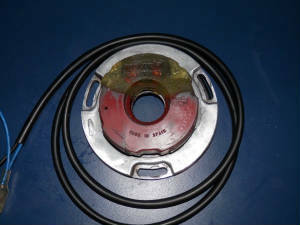 We can repair red spark plug wire coils. They all can be tested for a moderate fee. 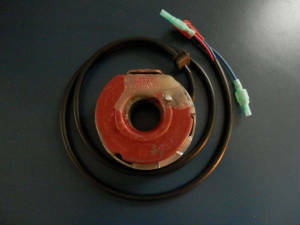 We have been receiving various types of ignition systems in for repair on a trial basis. If you do not see the type of ignition you need repaired send me an email. 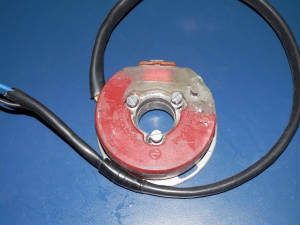 If you have an ignition that has wire wound coils chances are we can repair it! I have included in this site a packaging list form. When you are ready to send your system in for repair please fill out this form and submit it. I will receive an email which will give me all your information. This will help me keep all the contents in order and supply return shipping information. Due to mismatched parts from Motoplats coming in for repair. I will require the entire system before starting a rebuild. This will include the Stator, Flywheel and Coil. Please remove and hold onto the backing plate via 3 screws. This makes it much easier for me and the individual components you will be using can then be checked out as a system.